OVER 100 YEARS & FOUR GENERATIONS - August Thomsen Corp. (Ateco) has carefully refined our Ateco brand of cake decorating and baking tools, assuring that we offer the highest level of quality, functionality and relevance to today’s demanding decorators. American Cake Decorating magazine has been a key resource to the cake decorating community since 1995. Recognizing that cake decorating and sugar arts continue to grow as a profession and passion, ACD brings fresh, evolving ideas and inspiration to its readers. Sugar Arts Institute wholeheartedly recommends and endorses Somerset Fondant Sheeters for their high standards in performance and reliability. For well over 60 years, Somerset Industries, Inc., has set the standard for reliability, performance, and innovation in bakery equipment. Their Fondant Sheeters are designed and engineered to produce consistently reliable results, quick and easy clean-up and will save enormous amounts of time, therefore reducing labor costs and increasing cake decorating production with ease. Somerset sheeters are designed by foodservice industry professionals to streamline production and provide years of reliable performance. The Somerset name has become synonymous with quality and rugged dependability. When you buy a Somerset Sheeter for rolling fondant, you will NEVER look back! 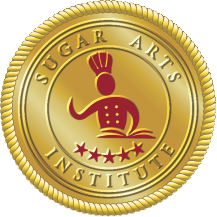 Sugar Arts Institute is proud to be partnering with Edible Supply!Edible Supply® was established and is built on the highest business and personal values of quality, through honest marketing and professionalism. Edible Supply annually updates FDA registration and inspection of food products and their facility. Their products are authentic Kosher certified edible products. The all-encompassing mission of Edible Supply® is to provide baking industries and professionals, including hobbyists "at-home decorating artists" with over-the-top quality edible pictures, photos, logos, events and celebration images that exude vivid color. They produce a wide range of products including chocolate and hot sugar transfer sheets, cake paint, piping gels, molds for Isomalt sugar, and the one-of-its-kind Blown Sugar Pump designed by Julie Bashore.